Cosurile, punctele negre si impuritatile dau tenului un aspect neingrijit, insa exfoliatul in exces nu este solutia. 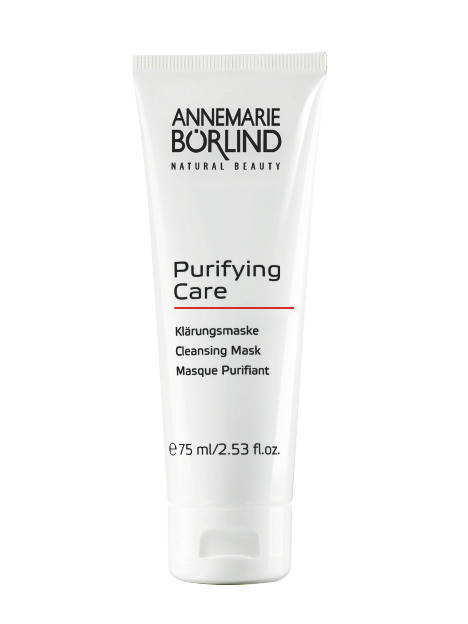 Purifying Care este o gama completa care acopera necesitatile tenului cu impuritati, de la curatare si masca, pana la crema calmanta, astfel incat tenul sa capete un aspect curat, purifiat. Masca purifica pielea in profunzime pentru a preveni reaparitia cosurilor si a rosetii. Ofera tenului un aspect proaspat si curat. Contine argila, extract de salvie si rozmarin. Este recomandata pemntru tenul acneic, cu impuritati. Mod de utilizare: Se aplica un strat subtire de 1-2 ori pe saptamana pe pielea curatata in prealabil, evitand gura si ochii. Dupa 5-10 minute se clateste in totalitate cu apa calda. Kaolin/china clay/white clay. A natural clay. Regulates sebum and mattifies. Used in powders and masks. An emulsifier from regrowing raw materials: plant glycerin and plant stearic acid plus citric acid. Binds oil and water. Cares for the skin. Corn germ oil. Smooths and cares for the skin and hair. A carrier oil with excellent skin-compatibility. Shea butter. A solid plant fat obtained from the seeds of an African tree. It has very good care properties and is ideal for dry, irritated skin. A thickening agent in emulsions. Sodium salt of salicylic acid. Gently dissolves corneous skin for a mild exfoliation effect. Has antibacterial properties and is used as a nature-identical preservative. It occurs naturally in many plants, the most well-known being the willow. Counteracts blemished skin and has a deodorizing and antimicrobial effect. Carrageenan. A natural gelling agent for cosmetics and foodstuffs that is derived from red algae. Used to make gels and to thicken emulsions. A fatty acid of glycyrrhizinic acid. An active ingredient in oil-soluble form obtained from licorice root. Alleviates irritation. Rosemary extract from organic farming. Has antioxidant and stimulating properties. Protects the skin. Its antioxidant effect also helps to prevent valuable vegetable oils from becoming rancid. Yarrow extract from organic farming. Stimulates the circulation and has firming, anti-inflammatory and antibacterial properties.